With 35 hours of new video being uploaded to YouTube every minute, the task of finding anything in particular has always been frustrating. Fortunately, a newly revised YouTube search system makes it much easier to specify topics of interest and weed out irrelevant results. The old YouTube “Search Options” has been replaced with a “Filters & Explore” drop-down menu, which lets you restrict your search to videos uploaded today, this week or this month, and specify features such as HD, long format and closed captioning. When you hover your mouse over an option a clickable plus sign appears, allowing you to combine several specifications in your search. On the right side of the page is the Explore section, which calls up related search terms based on your original input. 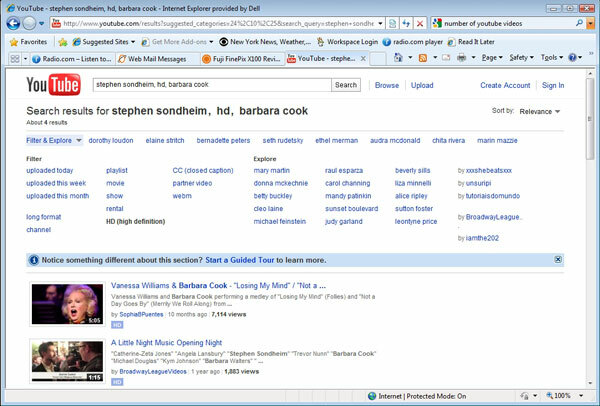 Search for Stephen Sondheim, for example, and the Explore section displays several performers who’ve recorded his work. Here again, you can add more than one item to your search by clicking the plus sign. And finally, you can choose one of several recommended upload sources suggested by YouTube. If you decide that your search terms aren’t providing the results you’d like, you don’t have to start over from scratch. By holding the cursor over any item you’ve included, you can remove it with a mouse-click. The best way to understand these new capabilities, of course, is to just dive in and give them a try. The first time out, the option to take a brief guided tour appears. And if you need more help, there’s a YouTube help article outlining all the changes.